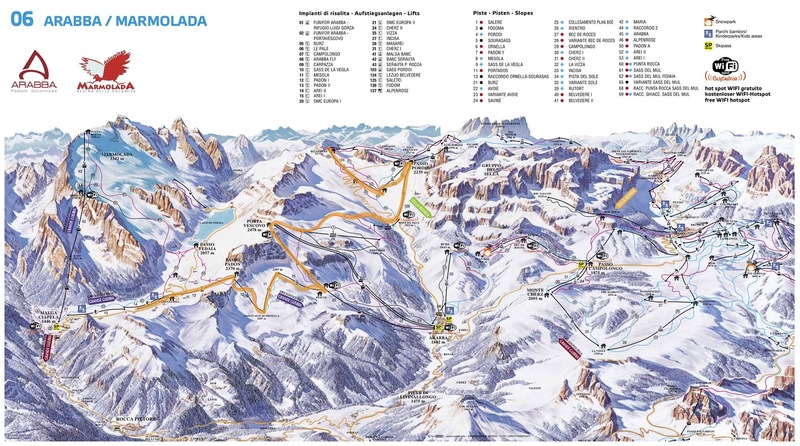 The Sellaronda Ski Tour – Orange. The Sellaronda is world famous – in the summer as a fabulous road and mountain biking tour, or in winter as an on piste, whole day excursion. You can do it in either direction, without using any other mode of transport than the ski lifts and the planks on your feet. It’s a wonderful thing to do and can be accomplished by any intermediate skier – if you can ski any red, it’s on. Indeed you shouldn’t be put off when looking at the map as this trip is more about the volume of skiing than the difficulty – bar a couple of slopes in the Arabba area, both directions generally follow the line of least resistance! Personally I prefer the Orange route but theres really not much in it. Of course if you are a strong skier, you can add detours for added excitement and I will detail some of these below. The Sellaronda encircles the Sella massif; a square chunk of Dolomite which was uplifted by the underlying igneous layer of rock in one piece. It’s a magnificent, apparently flat topped range, with only the occasional breech in its vertical walls through which a valley pours. Surrounded by the Ladin speaking valleys of Val di Fassa (Val de Fascia), Val Gardena (Val Gherdëina), Val Badia and Val Cordevole. Each valley has its main village from which the tour can start, or if you are in one of the outlying villages you can join it with a variation. From Casa Alfredino you have to do just this, starting in Malga Ciapela where you take a lift to Monte Padon which allows you to descend in a couple of runs to Arabba. You could also either drive to Arabba or Canazei in about half an hour. But for now I will describe the tour from Malga Ciapela. If you are not coming from there then ignore the next section. This route takes most people a whole day, especially if you add in some detours for lunch etc. You must be able to sustain a good fluid pace for the day to complete it. If you are a speed freak and straight line off the top of every lift and don’t stop it can be completed by the shortest route in about 3 hours 30 minutes – this should give you some understanding for the amount of skiing involved. There are frequent huts all around the route – it’s not really worth carrying a packed lunch with you as inevitably you will want to stop for a drink, and wolfing down some chips won’t cost much at all. Skiing unencumbered with either no pack or only a small one, is much nicer. 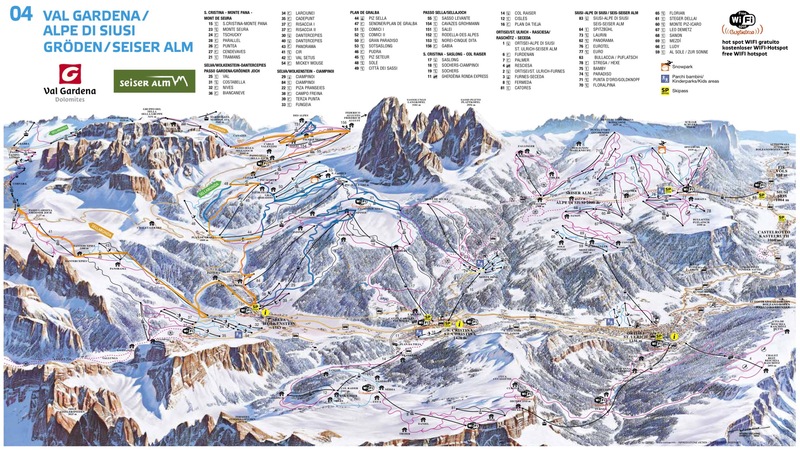 You will need a Dolomiti Superski pass which covers all the areas of the Dolomites. If you have a choice, avoid the end of the week and Sunday’s as these are the busiest days. Saturday (changeover day) can work well and also early in the week when people are still warming up a little. From Casa Alfredino drive or take the ski bus up to Malga Ciapela. If you have a car, there is a small carpark at the lift to Monte Padon which is further up the hill than the main Marmolada lift – if you reach the s-bends on the way up to Passo Fedaia you’ve gone to far. Jump on the lift which takes about 15 minutes. The red run down from here is quite intimidating, although it’s not as bad as it looks as it’s usually uncrowded and first thing in the morning will be perfectly groomed. It widens and becomes easier as you descend. when you get to the bottom, there is a small 2 seat chair which takes you to the middle of the Arabba range, again a 10 minute ride. This takes you in total maybe 40 minutes if you take it steady, and it’s a good warm up for the day. From here on I’ll describe the route in the Orange direction. I say Orange because the route is signposted with Orange arrows for clockwise and Green for anti-clockwise. Both are roughly the same difficulty – some people enjoy one direction so much they do it in the other the next day! So having skied down a blue run from the Malga Ciapela link, you will come to the mid-station of the bubble car lift to Portovescovo. Get on this and then ski down the short access run which links the to Portovescovo lift houses to one another. Coming around the corner you will find probably the hardest run of the day – handy whilst you’re fresh. It’s a steep and often very bumpy run which gets carved up by intimidated skiers. If you are lucky, keeping to skiers left and skiing the powder swept to the outside edge of the piste can give you a good run – keep left and you will inevitably get mixed up in the mayhem. However it is steeper on this side. Once down this slope, runs lead off leftwards – keep take the left most alternative which traverses the mountainside towards Passo Pordoi. Initially they are wide slopes with some steep pitches which can be crowded, so be careful – rolling into them at speed is asking for trouble – again the outside of the piste is your friend if you are. Then it transitions into a track which curls around the until you reach the long chair up to Passo Pordoi. 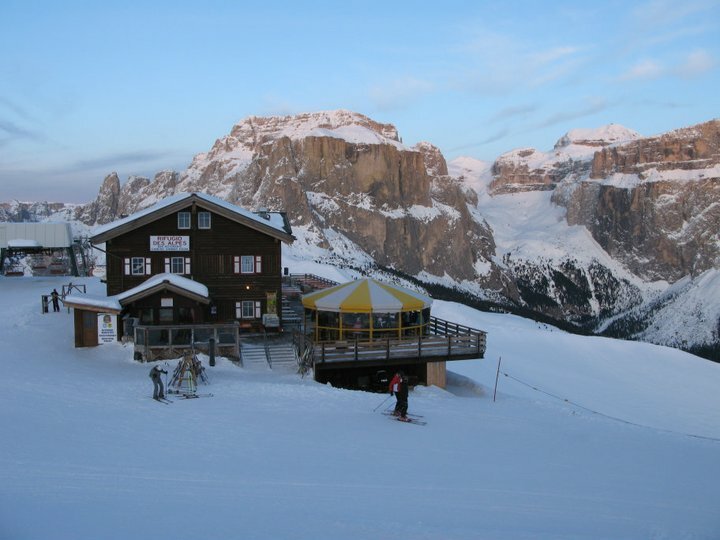 To get to the Val di Fassa slopes, ski down under the lift and then take the chair on your left – it goes quite steeply up to a summit in a col. This marks the end of one of the less interesting sections. The next run which is long and goes all the way to Lupo Bianco is excellent at the start. For side country skiers, duck under the ropes I front of you and there is an excellent area down between some rocks. On piste, the run which leads right is my preferred way, although either is good – down left there is a small boarder cross run which can be fun! The whole area funnels down towards a bowl just above the trees – lots of skiers congregate here as its a natural meeting spot. This then takes you down into a long valley run which is narrow with quite a few hairpins. It’s fun although often busy. After a few minutes there is a run to the right which you must take – not to do so will lead you down to Canazei which will mean walking back to the lift house, catching a ride back up to the bowl you’ve just come from and starting again – it is an easy mistake to make and if you do so towards the end of the day could be costly too if you end up in the wrong valley! Instead, you will go through a tunnel under a road and then arrive at bubble cars to Sella Pass. Here either schuss down to a short chairlift on skiers right, or for a small excursion, go left to a 2 man chair to the top of Col Rodella which affords a fantastic view. You have to return to the same lift, but it’s a worthwhile run, especially for the side country on skiers right. Finally you are set up for a run down to Selva Gardena. This section allows for the most deviation from the standard run. For the easiest run (although bad for boarders due to a number of flat sections), you can follow initially the red to Hotel Passo Sella, and then the blue all the way to Pian di Gralba. Alternatively, pull up at a 3 man chair on your left about half way down to Piz Seteur. If you ski towards where came from you will find a great red run, called Falk which takes you Plan do Grabla. Or you can take on of the runs over the other side of Piz Seteur which are directly infront of you when you demount the lift. This allows you to reach Rifugio Comici, a nice sport for a break in stunning surroundings. You need to take a couple of ski tows to do this. You can also reach this point from Pian di Gralba by taking the large cable car to Piz Sella. From Rifugio Comici either ski the eastern slopes down to Plan di Grabla, or better take runs westward beneath Sassolungo down to lift 21 – it’s a secret back run which is quiet and beautiful. Lift 21 then allows you to access Ciampinoi by way of another lift, 22 from where you can ski either the excellent black or red down into Selva di Gardena. Should you descend from Plan di Gralba, the run is a long easy red with a couple of short obvious lifts to gain you a little altitude in flat spots. All the described runs lead to a car park in the centre of Selva where you have to take your skis, go over an overpass and onto the next section. At the end of the overpass catch a lift, and then ski down to the Dantercepies bubble cars. This takes you to the pass in one fell swoop. Although this marks geographically the halfway point, in reality completing the route is now not far off and you can take you foot off the gas a bit. With one long red, you will descend to Colfusco beneath mighty north facing cliffs. Perpetually in shade, the runs are cold. On the right you will see ice falls through the trees, and it’s worth stopping to stare up at this massive cathedral of rock. If you fancy a detour, when you get to Colfosco, go up lift 46 (Cofosco) and then 50 (Forcelles). There’s a well positioned hut here which affords expansive views across the Sella – it’s worthwhile if you have time as you get a much better idea of this side of the Sella from here. 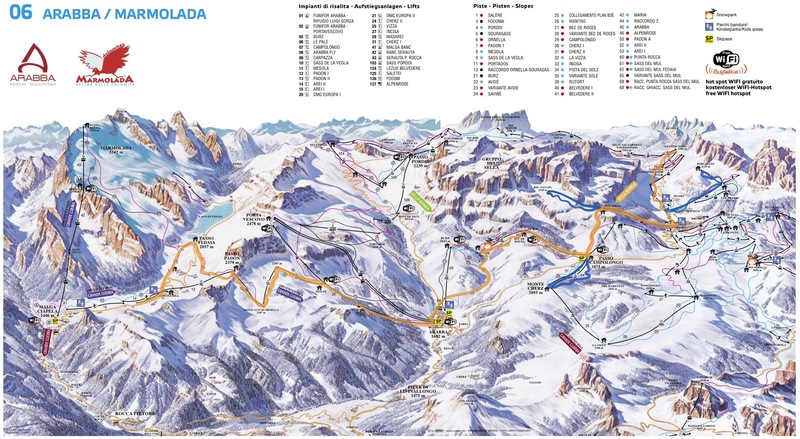 To get down to Corvara you have to take a lift – there are no runs. This is a pretty flat lift and it delivers you right to the lift house which accesses the next leg. The last leg is really nice again. Back in the sun, with some excellent runs and some opportunities for deviation. Lift 19 takes you up to the Boe ski area. Here you can either continue or take a lift to catch a steep black run, Vallon nestled in a bowl to your right. In years gone by the area just outside the lift station was a bind as it was flat to mildly uphill so pushing or walking was required but they now install a small conveyor lift to help – infinitely better! The run down to Passo Campolongo is good, although can get badly bumped at the end of the day as it’s in direct sunshine so the snow piles up progressively until it’s sometimes a real challenge. This happens on a slope about halfway down to the pass. Luckily the worst is not very long and you can usually ride them out by taking long diagonal runs across the slope. Or draw your knees together, ready your poles and imagine you’re on an Olympic Mogul run. Just don’t come crying to me when it goes wrong. After the moguls bear right at the next junction to catch the last lift you need to get to Arabba, Bec de Roces. If you have time, you can cross the road on lift 31 for a run down from Cherz – there a really nice sweeping red run which comes down through the trees – lots of fun for a quick blast. From Bec de Roces Arabba is one run away. The reds are all a blast here although late season they will be pretty slushy by the time you get there as they are plumb south facing and exposed. But, all things equal in a few minutes you will be at the new Arabba Fly lift which will transport you back to near the base Portovescovo lift. Here we recommend taking the DMC Europa 1 lift. The Cable car to Portovescovo is always jam packed whilst the DMC bubble cars seem to be missed by many who just pile onto the cable car as it’s the first option available. At any rate, in a few minutes you are back to where you started on the Sellaronda, all you must do is retrace your steps to Monte Padon and collapse in a heap!